This is a continuation of yesterday's mural by Shalak & Smoky. The bear was in the water yesterday and to the right of him up on the shore is this alligator with a wee top hat! The quality of the images that these two artists paint is wonderful. ...I never knew that gator grew this big in Toronto. Even with all those teeth, it looks friendly. The top hat must have some magic in it to transform a beast into a pet! This is an impressive mural. Love the gator and its background. So Colorful!!! Well Done & Dig That Bear Post As Well. This guy doesn't look as friendly as the bear but he is certainly painted beautifully. The top hat takes the edge off his fierceness Pat 😉 I agree fabulous piece of work, here and yesterday. A ugly creature but such a beautiful mural. Wow, fierce, but beautifully painted ! 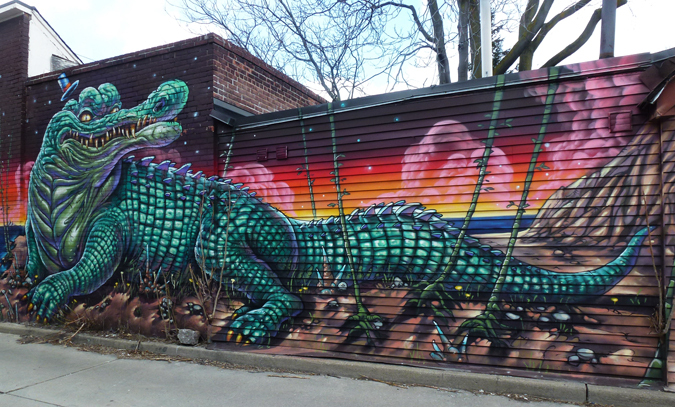 Wow, that is a mean looking gator, cool mural. Enjoy your day! Scary - but for the jaunty hat! Quality and creativity make for a good mural. I wish they'd make them smaller and easier to photograph. This hits too close to home today. In Davie, Florida, where we used to live, a gator pulled a woman in to the water and ate her a couple of days ago. I've not seen a gator here in Trilogy but we have lots of bodies of water and any body of water in Florida may have a gator. Great mural of that crocodile. If he had some beaded necklaces he'd fit in at Mardi Gras. Which was my first thought when seeing this mural. A lovely location to meet gators! This ural is a beauty.